Senate Majority Leader Mitch McConnell, R-Ky., speaks after a weekly meeting with Senate Republicans on Capitol Hill on Tuesday. The forecast from the Congressional Budget Office on Senate Republicans' latest health care strategy isn't great — but it's no surprise either. The CBO estimates that legislation that repeals key pillars of the Affordable Care Act (aka "Obamacare") would trim $473 billion off the federal deficit, but result in 32 million fewer insured Americans in the next decade. It would also see premiums rise, and likely force private insurers to abandon the individual market. And nearly every Republican has already voted for it. In 2015, after Republicans had won control of both the House and Senate, Congress enthusiastically sent a bill to President Obama that repealed most of his signature domestic achievement. Obama swiftly vetoed it. For Republicans, that vote was a political two-fer: it delivered a dramatic confrontation with the Obama White House and it proved to voters Republicans were serious about delivering on their promise to end Obamacare. All they needed was a Republican president to finish the deal. The legislation was dusted off this week after four Republican senators announced they would oppose a broader bill crafted by Senate Majority Leader Mitch McConnell of Kentucky to repeal much of Obamacare, and replace it with a new system of tax credits and more money for states to control health care spending. If "repeal-and-replace" can't pass, McConnell said he would revive the "repeal now, replace later" strategy as a last-ditch effort. The legislation, if enacted, wouldn't kick in for two years. In theory, that would give Congress enough time and a hard deadline to craft a replacement. Republicans also believe that it would force Democrats to the negotiating table. The White House appeared to rally around the latest strategy on Tuesday, even though the administration rejected the same strategy when it was first floated back in January. "President Trump and I fully support the majority leader's decision to move forward with a bill that just repeals Obamacare and gives Congress time, as the president said, to work on a new health care plan that will start with a clean slate," Vice President Mike Pence said in a Tuesday speech. Pence has been the administration's point man on health care. In the speech, he said "inaction was not an option" and kept public pressure up on the Senate to act. "Congress needs to step up. Congress needs to do their job and Congress needs to do their job now," he said. President Trump summoned Senate Republicans to the White House on Wednesday for a private meeting and, for some, a public reprimand. "Look, he wants to remain a senator, doesn't he?" Trump said, as he was seated next to holdout Sen. Dean Heller of Nevada. "I think the people of your state, which I know very well, I think they're going to appreciate what you hopefully will do." Administration officials are meeting throughout the week to try to find a bill that 50 of the chamber's 52 Republicans can support. McConnell is focused first on getting the votes he needs to clear a critical, procedural hurdle to begin debating any health care legislation. He needs 50 senators to vote "yes" on a motion to proceed to the bill. He says the first vote will be on the bill that only repeals most of Obamacare, but that could change if the White House can wrangle a deal before then. "I think we all agree it's better to both repeal and replace, but we could have a vote on either," McConnell said after the White House meeting. "And if we end up voting on repeal only, it will be fully amendable on the Senate floor. And if it were to pass without any amendment at all, there's a two-year delay before it kicks in." The only thing that seems certain — for now — is that the Senate will vote one way or another next week. 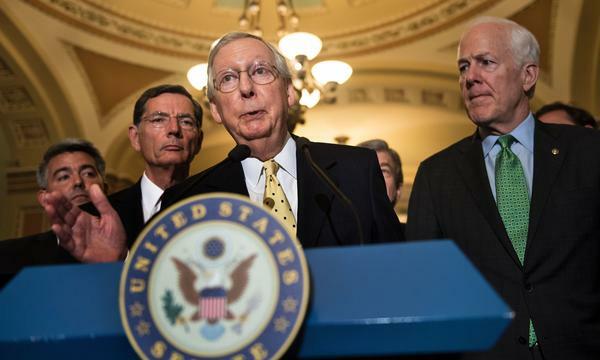 "I want to disabuse any of you of the notion that we will not have that vote next week," McConnell added, "We're going to vote on the motion to proceed to the bill next week."